The only thing lovelier than a romance…is a romance served with ice cream! 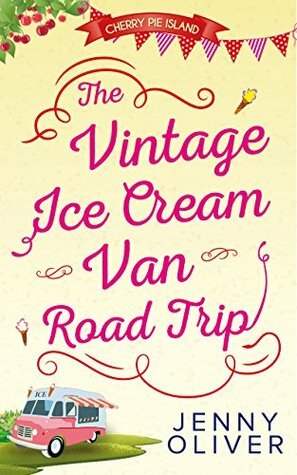 Don’t miss The Vintage Ice Cream Van, the second story in Jenny Oliver’s gorgeous new ‘Cherry Pie Island’ series. Welcome to Cherry Pie Island – once you step on to the island, you’ll never want to leave! I loved visiting Cherry Pie Island a few months ago so I knew it was time to revisit, and what better reason than to catch up with the characters. Its a sugar sweet quick read and a perfect pit stop between books. This time we follow Holly who is having to deal with a pregnancy she hadn't planned to a gent who shes believes has no intention of sticking around. When her friend Emily springs it on her that they want her ice cream van for her mothers wedding in france and that would require a roadtrip with the father to be makes for a beyond stressful trip, especially when wilf doesn't even know Holly is having his baby to start with. Cherry Pie Island is a beautiful place to visit, but traveling down to france made for a change, it was like a break within a break. The characters were as wonderful as always, and I adored the way we met up with everyone for a catch up whilst following the new story. Jenny has created a wonderful little island where you really do feel like you know everyone, and you are welcomed with open arms, the narrative flows and I flew through this read, not because it was easy but because I was hooked. I cant wait to revisit. Jenny Oliver is the author of the bestselling Cherry Pie Island series. The first five books - The Grand Reopening of Dandelion Cafe, The Vintage Ice Cream Van Road Trip, The Great Allotment Proposal, One Summer Night at the Ritz and Four Weddings and a White Christmas are out NOW! Mouthwatering, feel-good and the perfect escapism! Jenny Oliver wrote her first book on holiday when she was ten years old. Illustrated with cut-out supermodels from her sister's Vogue, it was an epic, sweeping love story not so loosely based Dynasty. Jenny's latest title, The Sunshine and Biscotti Club, set in sunny Tuscany, is out in May - just in time for your holiday reading!